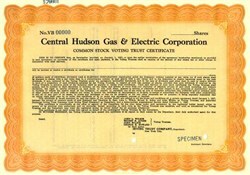 Beautifully engraved specimen certificate from the Central Hudson Gas & Electric Corporation dated 1937. This historic document was printed by the American Banknote Company and has an ornate border around it. This item has the printed names of the company's voting trustees and is over 63 years old. Central Hudson's roots go back to the year 1900, when on November 12, three men -- Thaddeus Beal, his father William R. Beal and John Wilkie -- purchased the two companies providing 5,000 Newburgh customers with electricity and gas, and then combined the firms into the Newburgh Light, Heat and Power Company. In doing so, they laid the foundation for what was to become the Central Hudson System which today provides reliable service to approximately 260,000 customers up and down the Mid-Hudson Valley. Messrs. Beal, Wilkie and their associates recognized the need for consolidation of the many separate electric and gas companies serving our region, and set about providing a new level of centralized, efficient customer service. In 1901, they formed the Poughkeepsie Light, Heat and Power Company; in 1902 they acquired the Electric Light Company of New Paltz; in 1905, the Cornwall Electric Light and Power Company was added to the system. In 1927, more than 60 companies operating under the Central Hudson System became the Central Hudson Gas & Electric Corporation. The consolidation of separate services continued throughout Central Hudson's history until 1960, when the Ellenville Electric Company formally incorporated. Throughout its rich history, one thing has remained constant for Central Hudson: our determination to meet the needs of our customers, or as Thaddeus Beal wrote three quarters of a century ago, "...win the reward of being accounted true servants of the public". As we approach a centennial of service to the Valley, customer service remains our highest priority. Central Hudson is a combination Natural Gas and Electric utility serving a population of approximately 623,000 in a 2,600 square-mile area of the Mid-Hudson Valley, stretching from 25 miles north of New York City to 10 miles south of Albany. Central Hudson serves parts of Albany, Columbia, Dutchess, Greene, Orange, Putnam, Sullivan and Ulster Counties. Central Hudson Enterprises Corporation("CHEC"), a wholly owned subsidiary of Central Hudson Gas and Electric Corporation, is a comprehensive energy services company and, has since 1982, been providing energy services programs throughout the Northeast. Central Hudson electric rates are the lowest in New York State and among the lowest in the north east. Moving Vigorously Toward the 21st Century ... Central Hudson is transforming itself into a market-based, customer driven organization. Our focus is changing from producing and supplying energy to capturing markets. In addition to being the lowest cost supplier, they plan on being the highest-value provider in the markets served. Map of Service Territory 2,600 square miles in the Mid-Hudson Valley, stretching from 25 miles north of New York City to 10 miles South of Albany. Central Hudson serves parts of Albany, Columbia, Dutchess, Greene, Orange, Putnam, Sullivan, and Ulster Counties.